This picture got screwed by the studio in its theatrical release, but don't miss it now. This is a great scary movie. Lights out! Sound up! Be prepared to spill your popcorn. The highlight of this disc is a terrific making-of featurette that begins with a neat effect shot showing the script being revised with on-screen cross-outs and notes showing changes that were made to the film's design and dialogue. This featurette is mostly un-narrated raw footage shot by director Twohy in rehearsal, and it's often played side-by-side with (or edited into) the scenes as they appeared in the film. And the editing is great, using a blueprint of the boat as a jumping-off point as scenes from the movie appear within the blueprint in the compartments where they take place before expanding to fill out the screen. This is not a cheap, promotional making-of shot as filler for pay cable. This is good stuff. The commentary with director David Twohy is passably entertaining, but he's invited way too many of the film's stars to sit in with him. It's almost impossible to keep track of who's talking, and they're mostly horsing around, not talking about the filmmaking. One other major complaint: The director makes no mention whatsoever of the original script by the brilliant Darren Aronofsky ("Pi," "Requiem for a Dream") or what changes he made in his re-write to make it his own. And apparently this track was recorded the day after the premiere (they all talk about seeing the film "last night"), which is way too soon. I'd like to have heard Twohy say something about how Miramax buried the movie. Plus, the audio on film is turned down too far on this track. When there's a break in the commentary, you can barely hear the film. However, actor Matt Davis has interesting criticisms of his performance, which made me think he's a more serious actor than I gave him credit for. A couple really great deleted scenes, with commentary by Twohy that explains very convincingly why they were left out. Already packed solid with all the claustrophobic wartime tension a good submarine thriller needs, "Below" squeezes in something more -- a startling, bone-chilling element of the supernatural. Set onboard an American sub called the USS Tiger Shark, cruising the Atlantic during World War II, the tightly drawn story begins with the boat doubling back on its planned course under orders to rescue the only three survivors of a torpedoed British hospital ship -- a crewman, a badly burned patient and a nurse (Olivia Williams), who causes consternation among the crew. She's pretty, sure. But more importantly, maritime superstition holds that women are bad luck on a submarine. Director David Twohy ("Pitch Black") wastes no time in building seat-gripping suspense. The Tiger Shark's sonar officer picks up an unknown contact just as the sub is surfacing amongst the sunken steamer's debris, so the rescue becomes a palpably perilous race against time. The scene is nerve-wracking, thanks in no small part to Twohy's touches of tense creativity (all the dread he needs is found in a single shot looking back at the captain's eye from inside the periscope) and a potently unsettling, untraditionally military score by Graeme Revell ("Pitch Black," "Blow," "Tomb Raider"). As the sub tries to make its silent escape by heading for deep, cold water where sound waves are more easily deflected, somehow a record player on board jumps loudly to life, playing Benny Goodman's "Sing Sing Sing." Soon the unmistakably chilling sound of a sonar ping resonates through the hull, followed by several depth charges that rock the boat -- and one apparent dud that bounces along the length of the ship, threatening to explode any second. But "Below" is just getting warmed up. That phonograph didn't just turn on by itself. Could the crew have brought a saboteur on board? Or could there be another explanation for this and other chilling events that begin to unfold? The nurse and some of the sub's crew start hearing eerie whispers from nowhere. Strange noises emanate from the depths outside. Poking around the skipper's quarters without permission because she suspects that something is amiss, the nurse discovers the handwriting in the captain's log has changed in the last several day. Has there been a mutiny? Twohy, working from an innovatively uncanny screenplay by Darren Aronofsky (writer-director of "Pi" and "Requiem for a Dream"), lets your imagination run wild with the possibilities while also suggesting the crew may simply be going batty from oxygen deprivation. In trying to shake the enemy vessel still stalking it from the rescue, the Tiger Shark has been underwater with a faulty circulation system long enough that the hydrogen count in air has reached 13 percent. Not only is that likely to effect the mind, it also makes the sub's atmosphere highly flammable. 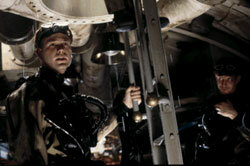 The rising stress onboard the submarine is brought vividly to the surface in terrifically agitated performances by Williams ("The Sixth Sense"), Bruce Greenwood ("Thirteen Days") as the captain who is trying to maintain his crew's grip on reality, Holt McCallany ("Fight Club") as his muscular but sharp-witted XO, and Matthew Davis ("Blue Crush") as an inexperienced but assertively intuitive young officer whose unorthodox ideas about what might really be happening on board this cursed sub haunt the thoughts of the other crew members -- especially once they loose control of the ship when an accident (?) on board is followed by a course change they can't seem to alter. The eventual reveal of the truth of these events is hair-raising, and the resulting actions on the part of the captain are even more shocking. And throughout it all, Twohy has a masterful grip on the story, meting out touches of the paranoid and the paranormal in perfect increments while creating a tangible ambiance of intelligent foreboding and a ghostly visual style (the underwater photography is gorgeous and eerie). "Below" is slightly impaired by a touch of too-hip and sometimes expository dialogue (Twohy did an uncredited re-write himself), and by the fact that the captain is implausibly lenient with the nurse, who, as the audience's surrogate, does a lot of sticking her nose in where it doesn't belong. And, as the film takes place in the 1940s, the inclusion of a token black doctor on board is a minor but notable credibility stretch. But even though you may find yourself wondering how much more brilliant and scary the pure-Aronofsky version of "Below" might have been (the writer was originally planning to direct the film himself), this is still a mighty sharp, mighty spooky, mighty spine-tingling movie.